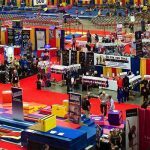 The 2018 USA Gymnastics National Trade Show will feature over 200 booths of products and information from over 70 different vendors from the gymnastics community. Special events, such as daily Live and Hands on Spotting lectures and more will occur daily in the exhibit hall. A visit to the Trade Show Hall is definitely a location any congress attendee should miss!! If family and friends are in town and not registered for Congress, they can buy a one day Trade Show Hall Pass for $5/day. Exhibits will be located in Exhibit Hall ABC in the Rhode Island Convention Center. Thurs., August 9 -…….8:00 a.m.-6:15 p.m.
Fri., August 10………. 8:00 a.m.-6:15p.m. Sat., August 11………8:00 a.m.-3:00 p.m.